That’s bad news for President Joko Widodo’s government, which is trying to rein in a current-account deficit and bolster the currency that’s tumbled to the weakest level since the 1997-98 Asian financial crisis. A rally in coal prices and the abundant reserves in Indonesia makes the commodity an ideal target in the government’s drive to boost exports and shore up dollar earnings. Asia-Pacific benchmark Newcastle prices have rallied about 10 percent this year and are averaging $105, the highest level since 2011, amid resilient demand in China, the world’s largest user. 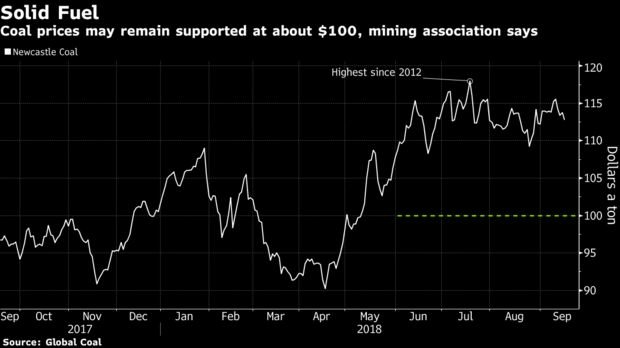 The prospects for tighter supply to support prices at about $100 have also been flagged by Australia miner New Hope Corp. The Indonesian government approved an extra 22 million tons of coal output for the rest of the year, about a fifth of the 100 million tons it was open to endorsing. While an increase of about 30 million tons in the next six months might be possible, according to Sjahrir, that would still be a relatively small amount compared with overall output. Indonesia produced 461 million tons in 2017 and shipped about 389 million, from 456.2 million tons and 370 million respectively a year earlier, according to data from BP Statistical Review and Bank Indonesia compiled by Bloomberg.